On Sunday at 10:36 am ET, Jeff Bezos’ private spaceflight company Blue Origin hosted its first live webcast of its successful attempt to launch and land the same New Shepard rocket out of its West Texas facility. The launch was originally supposed to take place at 10:19 am ET but it was postponed due to the scorching hot weather at the launch pad, The Verge reports. This is the fourth time in a row that Blue Origin has launched and landed the same reusable rocket. This time, the company was also testing the safety of its capsule. Uncrewed this time, the capsule is slated to carry space tourists into suborbital space, 62 miles above Earth, by 2018. There, they will experience a few minutes in the weightlessness of microgravity. As the reusable rocket booster eases itself back to the launch pad, three parachutes will carry the capsule safely to the ground. The crew capsule is outfitted with retro boosters and a “crushable structure” in the event of an emergency. Blue Origin was testing what would happen to the capsule if one its three parachutes failed. They wanted to make sure that any passengers riding in the capsule would remain safe. The test was a success — both the rocket and the capsule landed unharmed back on Earth. In the past, Blue Origin has been pretty tight-lipped about its activities. The company hardly ever gave interviews about its work, and the first few test flights of the New Shepard weren’t publicized until after they had wrapped up, The Verge reports. But now it seems that the secretive company is finally lifting the veil on its operations, embracing a more transparent approach. 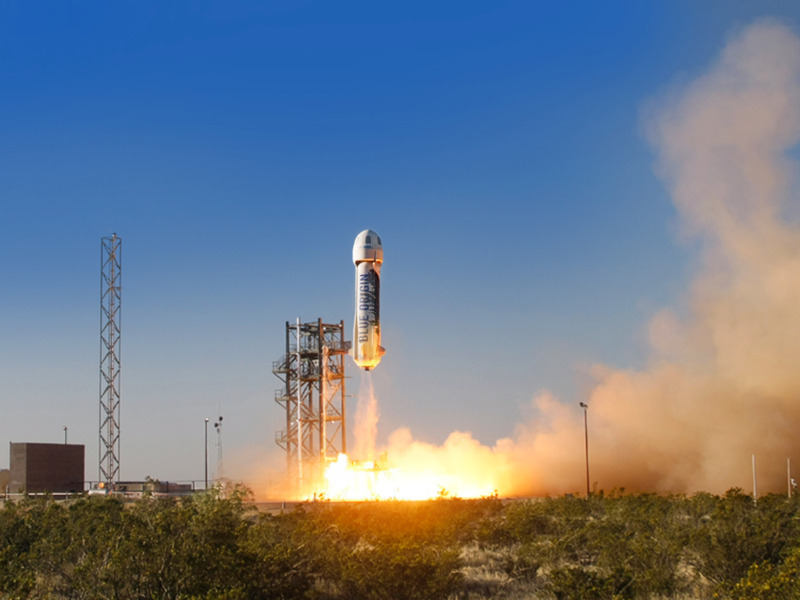 Hopefully, as Blue Origin continues test its technology over the next few years, we will have more opportunities to watch the (so far) dependable New Shepard rocket venture to and from space.